Claudio Toselli contributed these photos of this Italian Tornado painted in anniversary scheme. 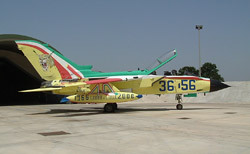 The 36° Stormo (36nd wing) "Riccardo Helmut Seidl" of the Aeronautica Militare Italiana (AMI - Italian Air Force) celebrated its 40 year anniversary at Gioia del Colle on June 22th, 2006. 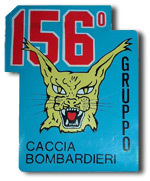 One of the Tornados of its 156 Gruppo (156th squadron) was painted in a special anniversary scheme for the occasion. The impressive colour scheme of yellow and the national colours makes it look like Italian ice cream. The aircraft is MM7013 '36-56' and is seen here at its home base at Gioia del Colle, in the south-eastern part of Italy. 36° Stormo consists of two squadron and one liaisons flight: 12° Gruppo operating the MB.339CD, 156° Gruppo operating the Tornado IDS and IDT two-stick trainer versions, and 636 Squadriglia Collegamenti operating the Piaggio P-180AM Avanti and the SIAI-Marchetti S-208M. It also flies the Aermacchi MB339A on loan from 61° Stormo.